Dublin, Tuesday August 14, 2018 – Sigmar today announces the creation of 50 jobs in Co. Kerry. The positions are for international recruiters to work in the company’s European Talent Hub, which has just opened in Tralee. Sigmar is currently seeking candidates to fill all of the vacant positions and calls for applicants from all backgrounds regardless of experience and education. Sigmar is investing in the development of a bespoke, world-class learning & development programme designed to equip individuals with all of the skills and knowledge necessary to become successful international recruitment specialists. The first of its kind in Ireland, the European Talent Hub will harness international talent for other international markets from its base in Tralee. The Sigmar employees in Kerry will be filling roles in IT for European markets with candidates from other countries. On making the jobs announcement, Sigmar Recruitment CEO Adrian McGennis comments: “Ireland has the talent to capitalise on current international recruitment opportunities. This investment will kick-start the group’s international growth initially in Germany, then other parts of Europe and the US. Sigmar has been very supportive of regional development and this investment proves our belief in the business case for regionalisation. This European Talent Hub will be a key element of Sigmar’s stated international growth. It’s also an operation where we can develop and test new technologies including robotics and Artificial Intelligence. We have been working on the processes, technology and markets for some time to accelerate our international expansion. Shaun O’Shea, Sigmar Head of European Recruitment adds: “As a Tralee native, I am truly delighted to help bring such a positive jobs announcement to the region. One of our deciding factors was the research into the area which highlighted the huge talent pool of ambitious individuals who we believe we can nurture with our experience and skills to help build new exciting career paths. 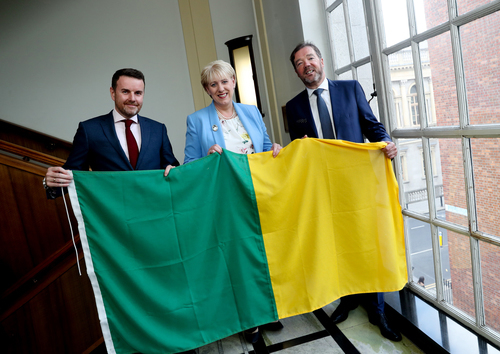 Speaking following the announcement, the Minister for Business, Enterprise and Innovation, Heather Humphreys TD, said: I warmly welcome Sigmar’s decision to open their European Talent Hub in Tralee. This new facility is a great vote of confidence in what Kerry and the South West have to offer, and a further example of the success of the Government’s commitment under the Regional Action Plan for Jobs to provide quality jobs in regional locations. Ireland has a skilled and talented workforce, and I have no doubt that Sigmar will find the right individuals here to enable them to grow their European activities in the coming years.